For this method we require a voltmeter of very high resistance and an ammeter of very low resistance. The unknown resistor, R, is connected in series with an ammeter, a rheostat, a plug key or other switch, and one or more cells. 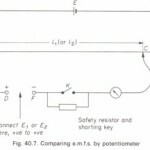 The voltmeter is connected across the ends of R (Fig. 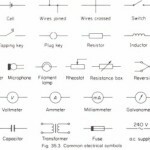 40.4 (a)). 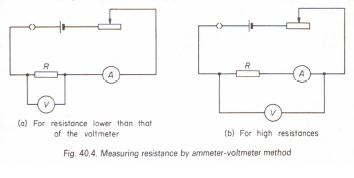 As a safety precaution to avoid damage to the ammeter. 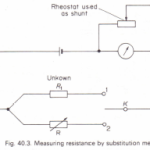 through overload, the rheostat should be set to maximum resistance, before closing the circuit. 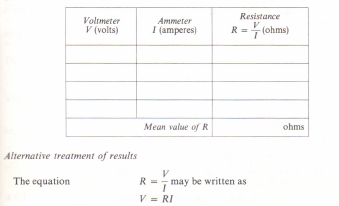 The rheostat is then altered to give a series of suitable ammeter and voltmeter readings.